Discover how sound economics, ethical entrepreneurship, and strong character empower students to succeed in the real world. Select Spots Are Still Available! 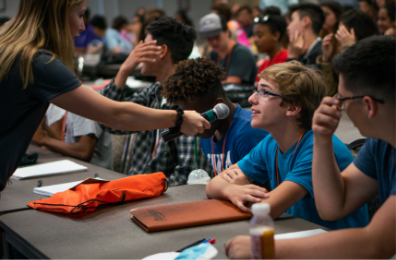 FEE’s 3-day summer seminars equip future leaders, ages 14 to 17*, with the tools they need for success, and take place in safe, camp-style environments on college campuses across the United States. *For Students ages 18+ check out FEEcon and Clemson. 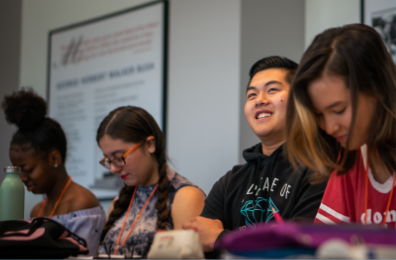 During their seminar experience, students learn critical thinking skills, develop economic literacy, and gain a powerful new lens to understand the world. Get a feel for the college experience. Students will spend the night in dorms, dine cafeteria-style at the dining hall, and learn in the same lecture halls as college students, for 3 days and nights. 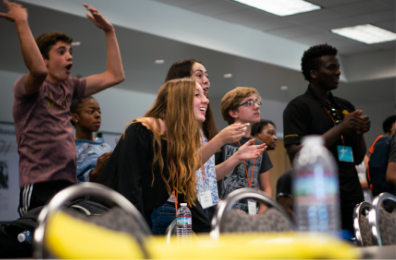 We bring in the most engaging professors and business leaders from across the country, and host team-based challenges, socials, and games to make the experience fun! Gain intellectual tools for success. Students develop the intellectual tools they need to create value for their community and accomplish their personal and professional goals. Designed with students’ interests in mind, FEE seminar themes connect core economic concepts to real world application. Choose which theme best suits your student! Discover what drives human behavior, and receive real-world examples of how you can apply these concepts to your day-to-day life. Understand the importance character and courage play in being a great leader, and discover how leaders use economics to make better decisions. Discover the “entrepreneurial mindset” and how you can use it to create value for yourself and your community every day. FEE is a 501(c)3 non-profit. Our affordable pricing and scholarships are made possible thanks to very generous supporters! All inclusive! Housing, meals, and a campus tour are covered. Students will get a feel for what college life is like by staying overnight on campus throughout the program. Male and female students will be housed in separate housing facilities and/or floors. Staff will be on campus with students 24/7. In addition to housing, all meals are provided. Students will dine cafeteria-style on campus and have access to a wide variety of choices to suit almost every diet. Limited tuition reimbursement scholarships are available and awarded on a rolling basis. In partnership with the Staley Foundation, we also offer limited travel reimbursement scholarships. Students who are awarded a travel scholarship will be reimbursed up to $500 in travel expenses after submitting valid receipts. Reimbursements will be distributed after the conclusion of the seminar. You can apply for a scholarship AFTER you finish registering for your seminar. Upon the completion of your registration form, a link will be sent to the email you registered with. You can expect an answer 2-3 weeks after you submit your application. Who should register for high school seminars? FEE's high school seminars are open to anyone between the ages of 14 and 17 who is interested in exploring the economic way of thinking. All we ask is that you are respectful, intellectually curious, and willing to engage in the presentations and discussions. I am 18-years-old, can I attend? Unfortunately, our 3-day High School Seminars are only available to students ages 14 to 17. This means that if a student will be 18 years of age at the time of the seminar, then they are not eligible to attend our high school seminars. But do not dismay! 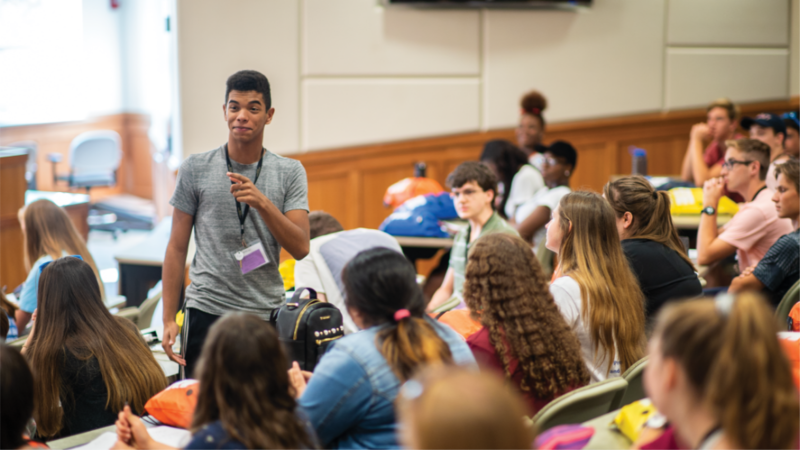 FEE's Summer Seminar at Clemson University is an immersive 3-Day experience where students learn about economics, international trade, free enterprise, all while consider the question, is capitalism moral? Tuition and Travel Stipends also available. Register now! FEEcon is the premiere event for college students and young professionals to learn and rub elbows with industry leaders, professionals, and other high-caliber young leaders. FEEcon is an unforgettable experience that will change the way you view the world and inspire you to transform your life. Don’t miss out, register now! How advanced are these seminars? The programs are designed to focus on fundamentals. We will talk about big ideas, and our goal is for you to leave with more confidence, prepared to take on the world. These programs should be a starting place on your journey to better understand the world and to change it for the better. Thanks to the generosity of our donors, seminar tuition is $79. The cost is all inclusive and covers materials, lodging, and meals for the entirety of the student’s stay on campus. Shuttles are provided to and from the closest airport for students traveling by air. These shuttles are cost-free for students. Other than the shuttles provided to and from the airport, students are responsible for travel to and from the seminar. Good news, tuition reimbursements are available! Students may apply for a tuition reimbursement scholarship after they have paid the full $79 tuition fee during registration. Here’s how it works: after you submit your completed registration form, we will send you a link to the Scholarship Application, including applications for both tuition and travel scholarships (see below). Scholarships are awarded on a rolling basis until seminar registration closes. Qualifying applicants will receive reimbursement for the full tuition fee AFTER attending the seminar. Please note: Students that are awarded tuition reimbursements are required to complete their online, pre-seminar course before the seminar in order to receive their reimbursement scholarship. The pre-seminar course will be available and sent by email on April 17th. Through a partnership with the Richard Seth Staley Educational Foundation, we are also able to offer a limited number of travel reimbursement scholarships! Just like tuition scholarships, travel reimbursements are awarded on a rolling basis. Qualifying applicants will be reimbursed up to $500 in travel expenses after attending the seminar and submitting valid receipts. Qualifying expenses include airline tickets or mileage reimbursement of 58 cents per mile if driving a personal vehicle (this is based on the IRS mileage reimbursement standard). These reimbursements are also paid AFTER the conclusion of the seminar. Please note: Rental cars, gas purchases, checked bags (air travel), bus and train tickets are not applicable travel costs. How do I get my tuition reimbursed? Tuition reimbursements are distributed in the form of a refund onto the card used to pay the tuition fee. You should expect these refunds within 3-5 business days following the seminar, but it may take an additional 5-10+ business days for the reimbursement to show up on the bank statement after being processed. You will receive an email confirmation of the refund once it has been processed. Students may be provided reimbursement through Paypal. These reimbursements will be processed within 3-10 business days following the conclusion of the seminar. Students who request this method of reimbursement must have a valid Paypal account. Students may request to have their reimbursements distributed as a personally-addressed check, mailed via USPS. These reimbursements will be processed within 11-20 business days following the conclusion of the seminar. These reimbursements are written and addressed to the student that received them at their home address. Due to facility constraints, we are only able to offer a certain number of spots at each of our seminars. However, the reality is some people who register, often through no fault of their own, are unable to attend and have to cancel their plans. As spaces become available, we will go through our waitlist, on a first-come first-served basis, and notify waitlisted registrants to confirm their spots. Notified registrants will have 48 hours to confirm or risk being dropped to the bottom of the waitlist. Final registration waitlists will cut off 6 weeks before the seminar start date. At that time, we will send an email notifying all waitlistees that the seminar is officially closed. Full refunds will be given to all waitlisted registrants who do not get accepted. Registration fees will be refunded onto the card that was used to pay during registration within 5 business days of the waitlist cutoff. If you are waitlisted and you would like to move your registration to another seminar with open registration, email seminars@fee.org, and we will gladly move your registration to a new location up until six weeks before the start date of our other seminars. You will be removed from this waitlist upon that registration location shift. When does registration close for seminars? Registration closes April 15, 2019, 11:59 PM EST. Is there a Code of Conduct for students? All FEE seminar attendees are expected to conduct themselves as mature and responsible students. During the registration process we ask that all students sign the Student Code of Conduct which includes details about remaining on campus, staying on your designated hall, bed checks, and upholding FEE's core values (integrity, excellence, respect, accountability, creativity, and courage). Parents will be contacted and students will be asked to leave campus at their own expense if these rules are broken. What steps does FEE take to promote safety at seminars? For more than 60 years, we've made the safety and well-being of our students our highest priority. All FEE seminar staff undergo background checks and the student to staff ratio is approximately 10 to 1. FEE staff and chaperones stay on campus with students. We greet our students at designated airport locations and offer shuttle buses to and from the seminar site with a FEE staff member or chaperone on board. Students are supervised by our staff during the day and in the evenings they have mandatory floor checks by their assigned staff member of the same gender who sleeps on the same floor. Male and female students are housed in separate housing facilities and/or floors. Per the Student Code of Conduct signed by all students during registration, students are required to stay in their rooms after bed checks (10:15 PM) until 6 AM, unless their dorm provides hall-style bathrooms. Emergency communication plans are also in place, allowing us to communicate directly with students, parents, and emergency contacts in the event of an emergency. How do students get to the seminar? Instructions will be emailed on when and how to arrive on campus. The dress code for seminars is casual. Please be aware that we will be taking photos during the seminar that may be used for marketing purposes. Students should wear attire that they would feel comfortable being photographed in. Also, students should bring all toiletries and personal items they would need for any overnight trip. Check your email for specific instructions on linens, since requirements vary per seminar. We also recommend that you bring a notebook and pen to take notes during the talks and a water bottle to stay hydrated during your trip. What dining options are there for students? Students will be dining on campus for all meals. On-campus dining will be “cafeteria style,” common to college campuses, with a buffet of options that meet the requirements of most diets. Can students request a roommate? Yes. There is a space for you to request a roommate during registration. Will there be exercise facilities available? Indoor exercise facilities are not provided during the seminar. Students are welcome to run or workout during free time, but keep in mind that the seminar schedule is very full, and students are expected to attend all talks and activities. Are students required to attend all talks and discussion groups? Yes. In order for students to receive the full seminar experience we ask that they participate in all talks and activities. Will there be any pre-seminar reading assignments? Yes, students will receive reading materials and an online, pre-seminar course via email to prepare for the reading discussion groups. Please note that students awarded tuition reimbursement scholarships are required to complete their online, pre-seminar course before the program in order to receive reimbursement. Are parents allowed to observe the seminar that their child attends? Yes, we welcome observers for sessions! How can students cancel registration? Please fill out our Cancellation Form. You can also send an email to seminars@FEE.org. Please refer to the Cancellation Policy below to see if your cancellation will result in a fee. For the Foundation for Economic Education (“FEE”) to continue to provide the best possible seminars and events at a low cost to its participants and to respect our generous donors who fund these programs, it is imperative that we have an accurate attendance count for the 2019 FEE seminar (the “Seminar”). FEE understands that your plans may change. It is important for you to inform us in a timely manner if your student is not able to attend the seminar, so that FEE can minimize any additional expenses that FEE may incur. By submitting your 2019 seminar registration, you acknowledge and agree that you accept this Cancellation Policy and the terms and conditions hereunder and will comply with the deadlines set forth in the Cancellation Fee Schedule set forth below. Notice of participant’s cancellation provided to FEE hereunder (the “Notice”) shall be in writing by email with confirmation of transmission to seminars@FEE.org or by filling out FEE’s web-based Cancellation Form. The Notice is effective only (a) upon receipt by FEE, and (b) if the participant giving the Notice has complied with the requirements of this paragraph. If you fail to provide FEE with the Notice in accordance with the terms and conditions herein, FEE shall retain the entirety of the entire tuition charge. Receive more information about the seminar experience, scholarships, registration, and more! Looking for college seminars? Check out Clemson or FEEcon!